Tom Kessell has had to bide his time. But the summer signing is now ready to take his chance at Saints. With no LV= Cup games this season, players on the fringes of the first team have had to show the patience of, well... Saints. Kessell, who spent time with Cornish Pirates and Bristol in the Championship last season, has been restricted to Aviva A League appearances. Club captain Lee Dickson and Samoan star Kahn Fotuali’i have a rotation policy, where one starts two games then the other starts the following two. That means Kessell hasn’t had a look in, as the coaching staff look to keep their top two happy. But on New Year’s Day, the door finally opened. Fotuali’i pulled his hamstring during the first half of the win against Exeter Chiefs and the following week, Kessell found himself on the bench at Leicester Tigers. He didn’t get on the field, instead watching on as Saints battled back from 21-0 down to level at 27-27 before losing 30-27. But Kessell’s chance did finally come last week, and in the most intense of environments. 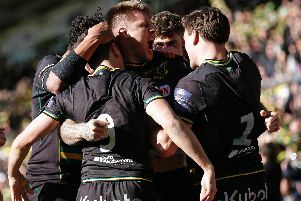 With Saints 15-12 down and heading out of Europe, Kessell emerged from the bench for the final five minutes as his side sought to make a crucial breakthrough. And break through they did, as Kessell helped inject some tempo and Stephen Myler’s superb cross-field kick found George North, who palmed the ball to Harry Mallinder for the match-winning score. It was a beacon of light in an otherwise gloomy game, and Kessell had enjoyed a fantastic end to his five minutes on the field. “It was awesome,” said Kessell, who turned 26 this week. “I’ve played at Franklin’s Gardens for the second team so I was used to playing on the pitch a little bit, but just to be playing in front of that crowd and to get the late win was pretty perfect. Enjoy it he did, and that has been a theme of his time at Saints so far. It is a step up from Pirates and Bristol, and Kessell notices some key contrasts. “It’s a bit different to what I’m used to, but I’m really glad to be up here,” he said. “If you just look at the gym here, it’s pretty massive compared to what I’m used to. And Kessell will again be involved this weekend as Saints head to Scarlets for another must-win Champions Cup match. “We want to try to go as far as we can in Europe, so we’re looking forward to the opportunity as a team. “There’s always pressure in every game you play, so this won’t be much different. If he gets the chance, Kessell will look to bring things he has learned from both Dickson and Fotuali’i to Saints’ game. And he said: “I’ve got a massive amount from them. “It’s just little things you learn in games and when you get onto the pitch you can make it happen. “Watching them in training, you can go away and ask them questions so you can learn. “They are both international players. Now it’s time for Kessell to try to get above them in the Saints pecking order.